SsangYong may be the oldest Korean car maker, but here in the UK it comes a distant third in sales behind KIA & Hyundai, primarily because it is known back home as the Korean Land Rover. However, the brands regeneration, which began with the C sector hatchback Tivoli & larger Tivoli XLV showed UK buyers that SsangYong’s designers can make & build a pro-European car. 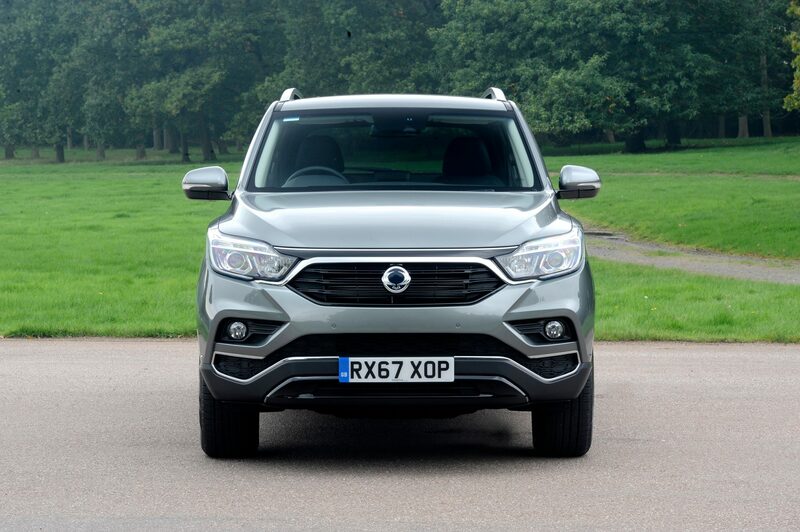 The latest stage in the SsangYong development is with the launch of a brand new Rexton, which is SsangYong’s flagship & large SUV model, which competes with the likes of the Land Rover Discovery, Hyundai Santa Fe & KIA Sorento. Ssang Yong is committed to introducing a new car every year for the next three years, which includes a pick-up truck derived from Rexton early in 2018, to replace the Musso. In line with all manufacturers, the company is also focused on creating further growth, by developing petrol powered, EV & other eco-friendly vehicles. These new models are also in the pipe line. There are three models from launch: Rexton EX, ELX & Ultimate, with all sharing the same body style & powertrain. The EX comes with seven seats, the option of 6-speed manual or 7-speed Mercedes-Benz automatic transmission, 17” alloy wheels, manual air conditioning, smart audio system with 8” screen, power/folding door mirrors, front & rear parking sensors, automatic headlights & wipers, cruise control, plus electronic safety features including forward collision warning, autonomous emergency braking system, lane departure warning, high beam assistance & traffic sign recognition. On the road price is just under £27,500. The ELX has seven seats (five seats as an option) & adds 18” alloy wheels, dual zone & rear air conditioning, a Supervision instrument cluster, Tom Tom navigation with a 9.2” screen, speed sensitive power-assisted steering, heated steering wheel, rear privacy glass, nappa leather upholstery, heated & powered front seats, Smart key, electro-chromic driver’s mirror, plus nine airbags & is priced from £32,000. Step up to the Rexton Ultimate, the model we were lucky enough to drive & you get 7-speed Mercedes-Benz automatic transmission as standard, five seats, 20” alloys, HID headlights, LED fog lights with cornering function, interior mood lighting, stainless steel door finishes, 3D around-view monitoring, land change assist, blind-spot detection & rear-cross traffic alert, quilted nappa leather, heated & ventilated memory power seats & a ‘smart’ electronic tailgate. This top of the range model retails at £37,500. Previous Rexton’s were not exactly pleasing on the eye, so the new model I’m pleased to say looks good & is a major improvement over the previous model, featuring an aggressive front end, subtle lines down each flank & a handsome rear end. Climb aboard & it’s immediately clear that the interior has improved at least ten-fold. The quality & functionality is first-rate & whilst it may not be quite up to the inside of a Land Rover, it’s a vast improvement over the previous model & is now more than a match for it’s Korean competition. The dashboard features some nice soft-touch plastics & the switchgear feels solid & built to last. The premium Nappa upholstery on our test car take things up another notch. All of the goodies one would expect from an upmarket SUV are included & we were especially impressed by the 9.2” touchscreen, the simple to use SatNav, the connection & implementation of Apple Car Play, the DAB radio & the Bluetooth hands-free phone connection, al of which we utilised during our driving. 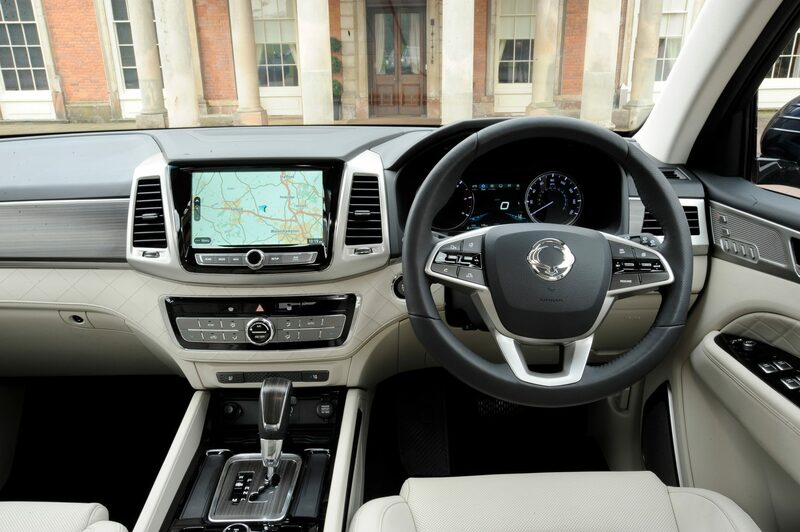 If it’s space you’re after then the Rexton will tick al the boxes. It’s 15cm longer & 13cm taller than a Hyundai Santa Fe. This means that front passengers are spoiled for both head & legroom & the middle row of seats on our test car offer enough space to sit three in comfort. Even seats six & seven can be described as ‘proper’ seats, offering enough room for two adults to sit comfortably in there. Boot space is cavernous; 820 litres with five sets in place increasing to 1977 litres with the second row of seats folded. With seven seats in place though, the boot all but disappears. On the road, the new model is a pleasure to drive. On B roads it handles well, with only a little noticeable body-roll around the corners. On A roads & on the motorway, it really come into it’s own, offering passengers a comfortable ride on the smoothest surfaces. A 0-62 mph time of 11.9 seconds, means that you won’t get anywhere quickly, but once up to motorway speeds & when utilising cruise control, the Rexton is a lovely place to be. Long motorway mile will be eaten up in comfort & the spacious interior means your passengers won’t have cause to complain either. The Rexton is still constructed with a body-on-frame design, which means in truth, it isn’t quite as enjoyable to drive as the softer off-road Santa Fe & Sorento. However, if you flip the construction argument around, the Rexton is now fitted with a lot more high-strength steel than it’s predecessor which actually improves it as a towing car & it still excels off-road, where the Hyundai & KIA will not. With a 3.5-tonne braked trailer limit, agricultural & equine customers should take note, because the Rexton ticks all of the boxes for you, whilst also acting as a comfortable family car, that’s loads cheaper then a Discovery. Business customers in the market for a large towing 4X4 SUV, won’t expect great fuel economy or emissions from their vehicle. With a claimed combined economy of 34mpg & emissions of 218g/km our Rexton Ultimate falls well short of the “new kids on the block,” such as the SKODA Kodiaq 2.0 litre 190 DSG which we drove in June. This comes with emissions of 151g/km & a claimed combined fuel economy of 49.6mpg. In reality though, the Rexton is bigger & is far more capable then the Kodiaq & it’s ilk off-road. So despite the high emissions & so so fuel economy, it’ still is a much more sensible proposition if you need your SUV to work for you. SsangYong’s come with a reassuring 5 year unlimited warranty & knowing the Korean obsession with reliability – a fleet of Rexton’s drove from Korea to London over 50 days this year, travelling across two continents, ten counties & plenty of unmade roads, without any breaking down or even having a puncture – customers can relax knowing that their Rexton come’s built to last. 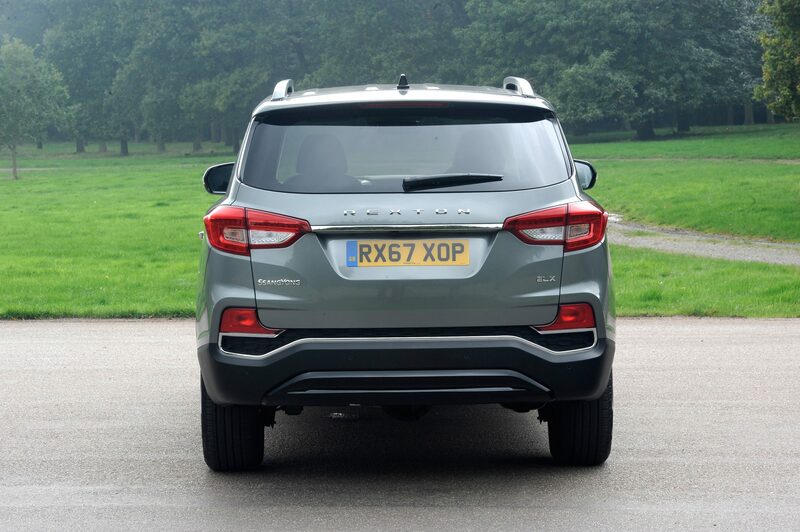 In conclusion, whilst the new Rexton is light-years away from SsangYong’s of old & is likely to be far more competitive in it’s sector then before, it is still a car that is there to take on the toughest jobs & as such, is much more a competitor for a Land Rover Discovery, than for a Santa Fe, Sorento, Kodiaq or Koleos. Whilst these models are arguably better soft-roaders than the Ssang Yong & are set up & priced accordingly, the gap between them & the Rexton has been significantly reduced. If you can do without ALL of the goodies, we would suggest that the lower spec EX Auto, which costs £29,500 OTR is a good bet for business users. It still tows the same as the Ultimate & offers the same off-road prowess, but by opting for this model, you’ll keep £8000 in your pocket, which is much more than just small change. The Korean Land Rover has finally landed 3.5/5.